Hungary President Pál Schmitt (right) receives the United States Sports Academy’s 2011 Eagle Award for his longtime commitment to the Olympic Movement in a presentation by Academy President and CEO Dr. Thomas P. Rosandich (left) at the fifth edition of the Peace and Sport International Forum on Thursday, Oct. 27 in the Principality of Monaco. Hungary President Pál Schmitt received the United States Sports Academy’s 2011 Eagle Award for his longtime commitment to the Olympic Movement in a presentation by Academy President and CEO Dr. Thomas P. Rosandich. 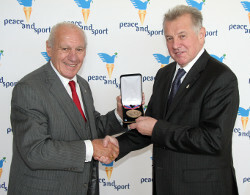 Schmitt received the Eagle Award at the fifth edition of the Peace and Sport International Forum on Thursday, Oct. 27 in the Principality of Monaco. The award is the Academy’s highest international honor which annually goes to a world leader in sport to recognize that individual’s contributions in promoting international harmony, peace, and goodwill through the effective use of sport. The 69-year-old Schmitt devoted nearly 25 years to the Olympics during his career and earned two team épée gold medals in 1968 in Mexico and 1972 in Munich for the Hungarian National Fencing Team. Dr. Rosandich also honored a second head of state on the same day, bestowing the Academy’s International Honorary Doctorate to H.S.H. Prince Albert II of Monaco, who is a five-time Olympian in the bobsled and longtime International Olympic Committee (IOC) member. Schmitt and Prince Albert are two of the honorees in the Academy’s 27th annual Awards of Sport celebration. Many of the 2011 Awards of Sport winners are being honored at The Artist and The Athlete Tribute at 5 p.m. Thursday, Nov. 10 and the Awards of Sport presentation at 4:15 p.m. Friday, Nov. 11 at the sport-focused university’s campus in Daphne, Ala. The event is free and open to the public.